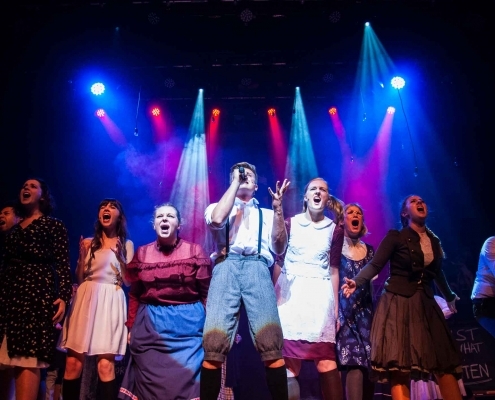 THE REVIEWS ARE IN FOR SPRING AWAKENING! I have said before how LODS appear to be the society that aren’t afraid to push boundaries and try put on shows other groups may shy away from. 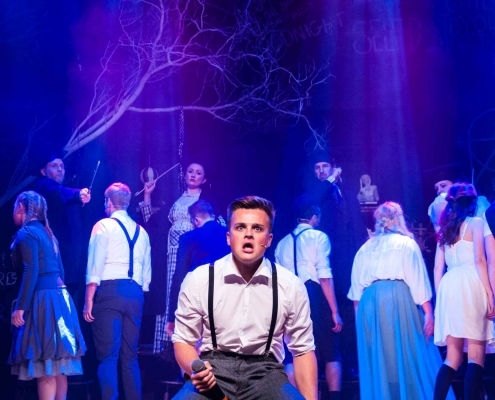 Spring Awakening is a hard-hitting, in-your-face musical that deals with sensitive issues and has a score that ranges from beautiful, haunting (traditional) ballads to modern sounding alternative rock pieces. You need a strong cast, with strong voices. As a show, it is a brave choice for any society, yet I was confident that LODS would do a good job, and I was not wrong. 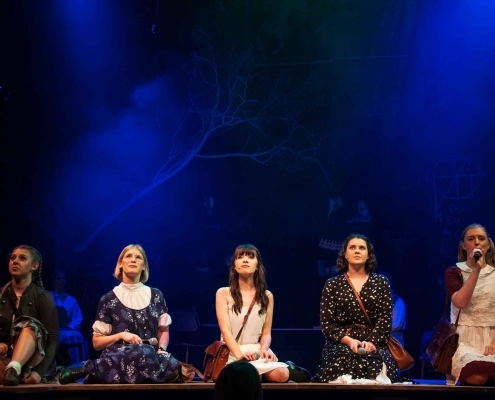 From entering the auditorium to see the amazing set and the, I assume, intentionally uncomfortable cast entrances, right through to The Song of Purple Summer, I was captivated, held entranced by the story, so well portrayed. Every single member of the cast played their roles / various roles, expertly. James Cohen’s Melchior was a joy to watch. His air of confidence never touched on cockiness and played so well against the pure innocence portrayed by Eva Tobin as Wendla. 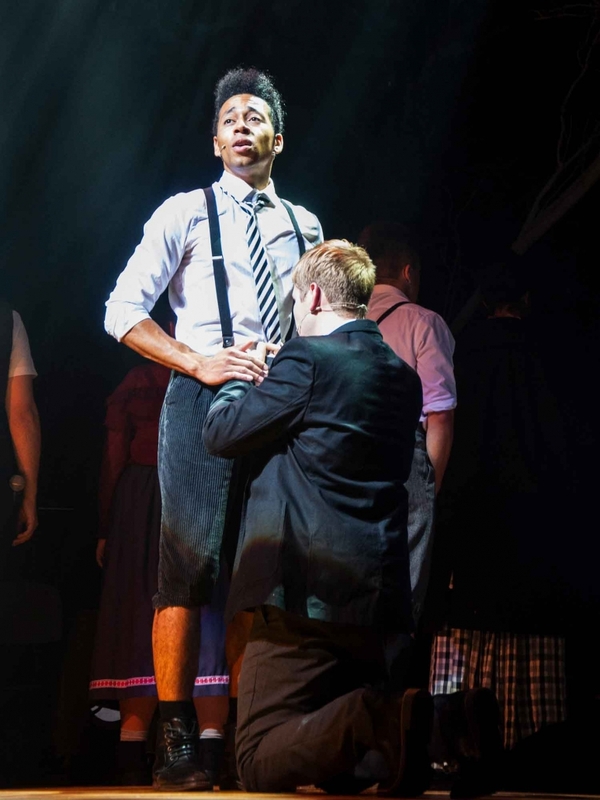 Matthew Wallace’s Moritz was captivating. The tense, twitching nature of the character must have been exhausting to play. 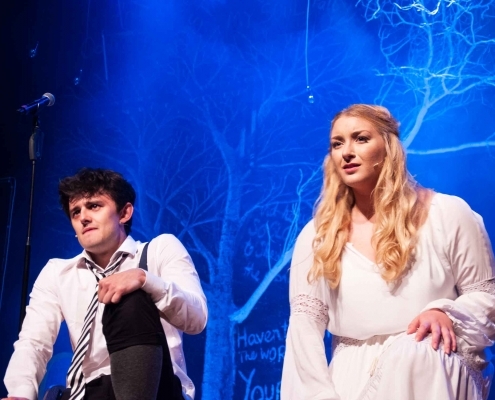 All of the ‘children’ also added their individual truths to the story – I particularly enjoyed Rosie Munns’ portrayal of Isle, Sam Blyth’s playing of Hanschen and Jason Weir’s Ernst. The ‘adults’ played their roles expertly too. 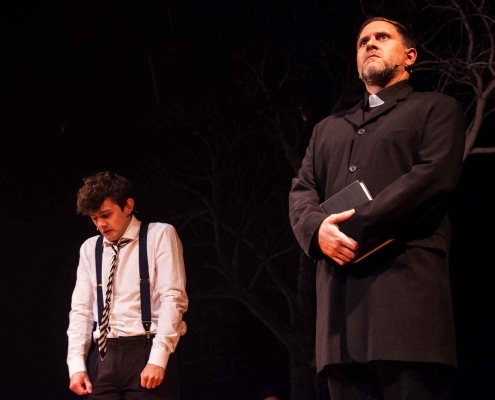 One stand out scene for me was Mortiz’s funeral – I was welling up during this – it was so well acted by every member of the cast. The singing, without exception, was truly amazing – I would go so far as to say flawless. 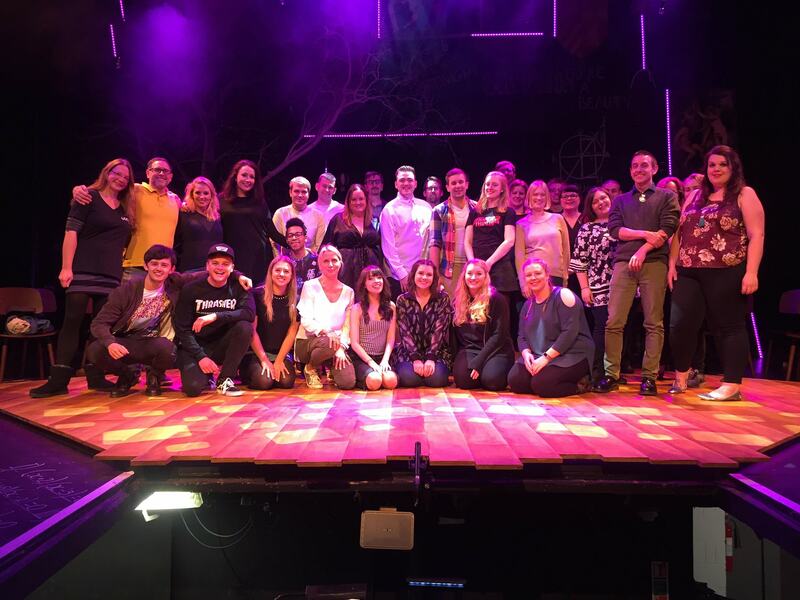 I cannot imagine the amount of work the cast and Musical Director, Rachel Plunkett, must have put in to make this happen. 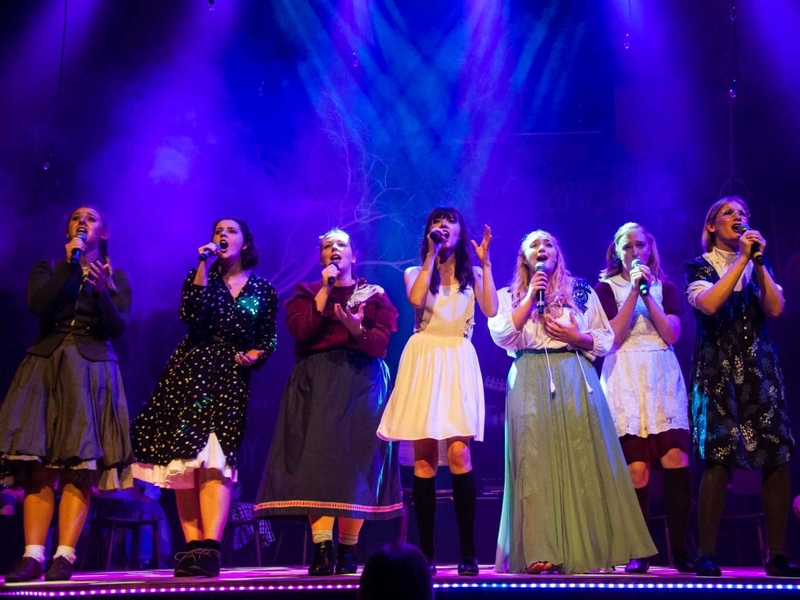 I know that it is often the rock numbers that steal the show for many people – the contrast of the modern style against the setting in late 1800s – but for me it was the ballads that stood out. Maybe I am too much of a traditionalist. 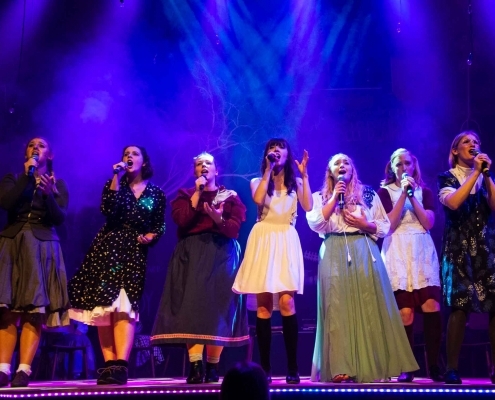 However the stand out number, which emphasised the immense talent of the group, was The Song of Purple Summer. I was sat with my mouth literally open at the beautiful sounds that were coming from the stage. 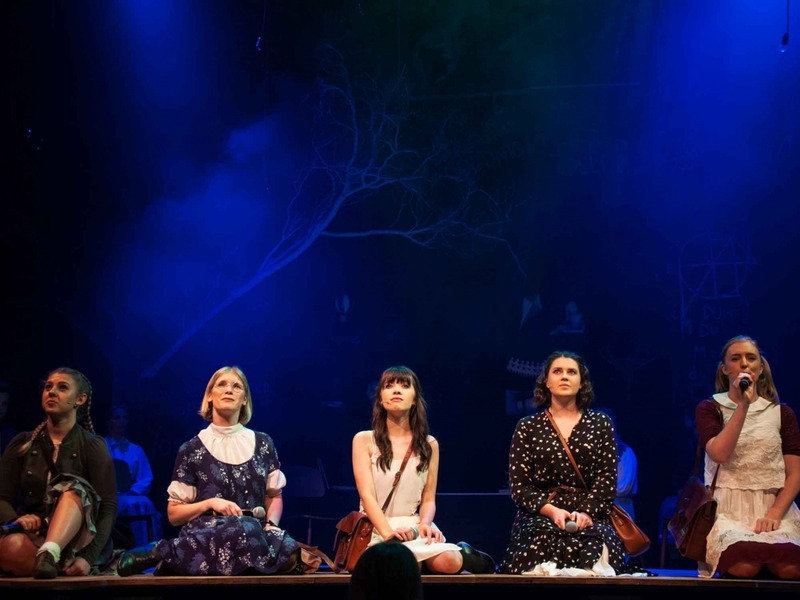 I have never really understood why the cast come on in modern clothing for this number, but it is as it is and it did not detract in this production due to the talent on stage. It has been said before and will, no doubt, be said again; if you want West End quality performances, LODS is not going to disappoint. 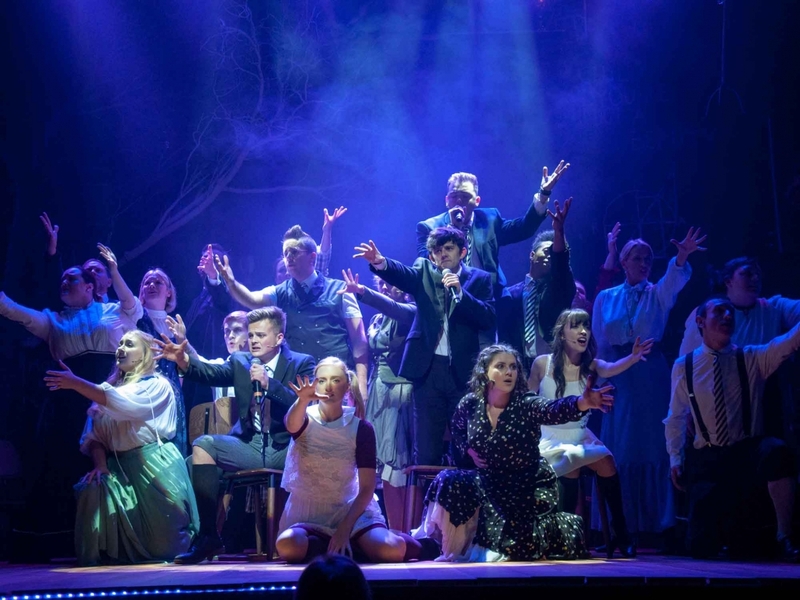 Well done to the cast, creative team and crew of this amazing show. ​LODS’s next production si to be All Shook up in May 2019. Unique’s the word. 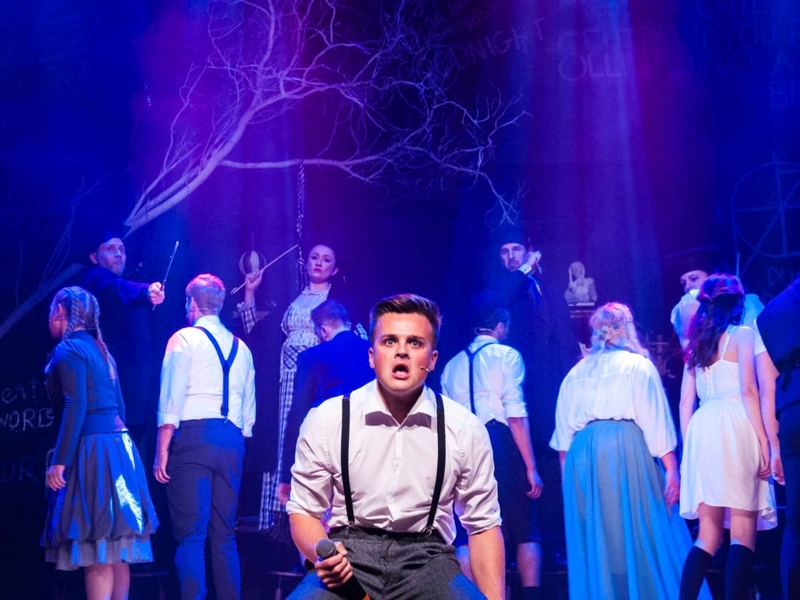 Spring Awakening belongs to no familiar genre, although its subject matter makes it perhaps a very distant cousin to a shows like Rent, or even West Side Story, which are based on the tribulations of youth. 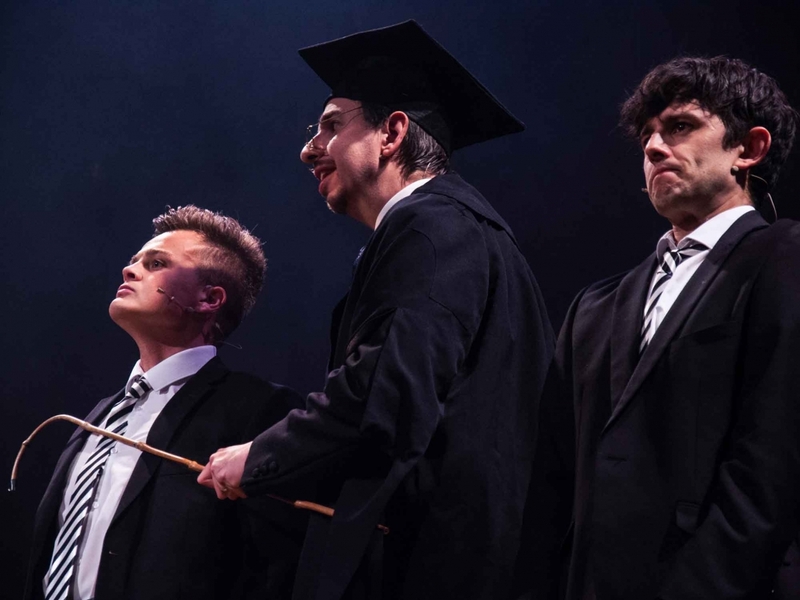 Set in a rigid German community that is hellbent on resistance to the new ideas sweeping Europe (represented by Freud, Ibsen, Darwin, Marx, and indeed Wedekind himself). 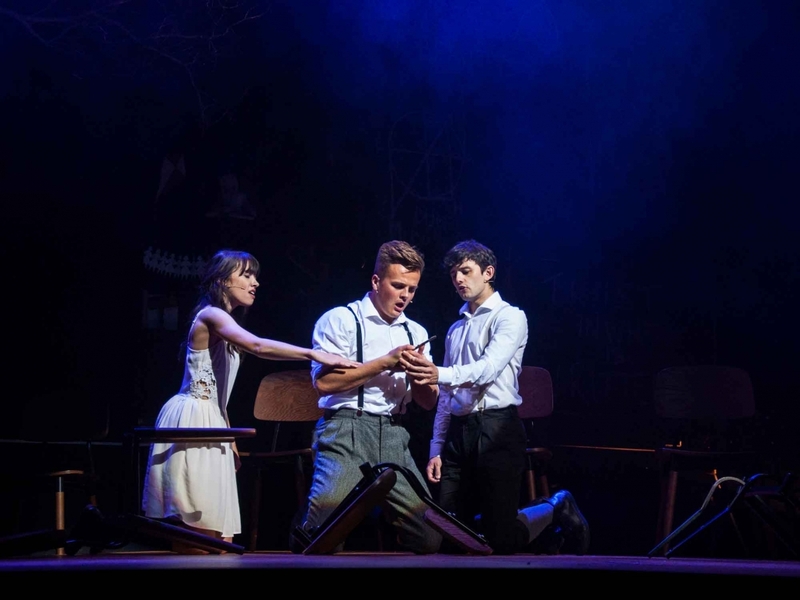 Spring Awakening focuses on a group of young people who take the brunt of these reactionary attitudes. Spoiler alert: the consequences include child suicide and death by abortion, though even these are viewed by the adults as all the kids’ fault. The opening scene brilliantly dramatises this tension, as the sweet-natured Wendla (Eva Tobin) pleads with her mother to explain “how babies are made”. Shocked and revolted, the mother covers Wendla’s head with a cloth, and then mouths empty rubbish about loving one’s husband. The consequences of this squeamishness prove catastrophic. 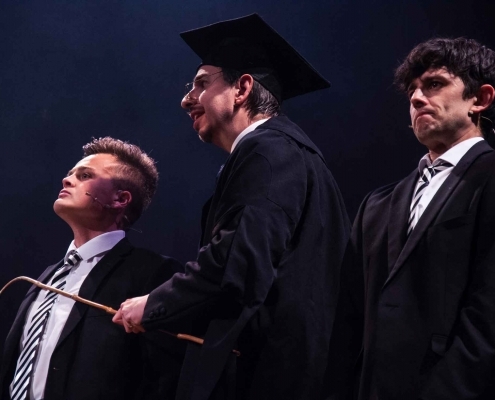 Meanwhile, Wendla’s intellectually brilliant pal Melchior is starting to question and even confront his parents and teachers, while the academically challenged Moritz disintegrates under the weight of expectations from the intransigent older generation. Be aware! – this may sound a bit depressing, but it ain’t. 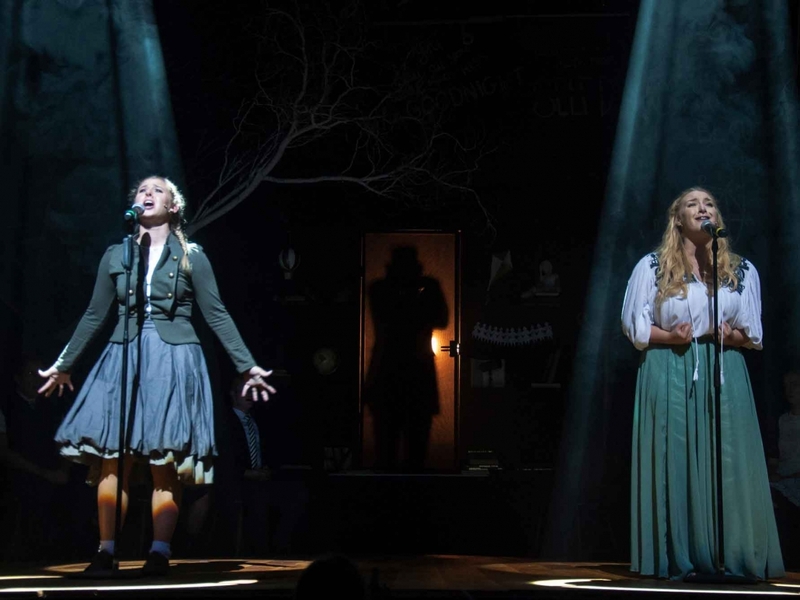 Spring Awakening has two vast assets which ensure, despite the tragedy portrayed, that you actually leave the theatre with a smile on your face. The other is the music. 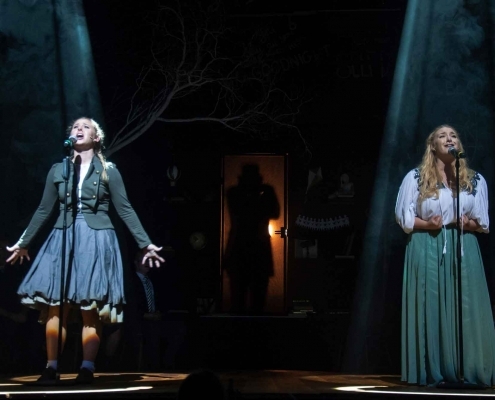 It is worth a second trip to the show just to focus on Duncan Sheik’s score. It may sound like a contradiction in terms, but this is essentially a restrained rock score. It discreetly supports the singers, and deepens the meaning of the lyrics, while never showing off. 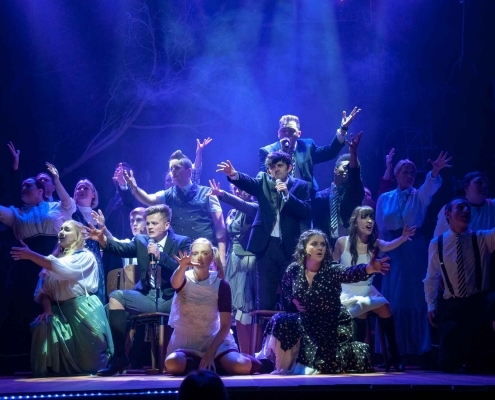 The honesty of the music ensures that the final big number, The Song of Purple Summer, is utterly convincing as an expression of hope for the future. This is a young person’s show. 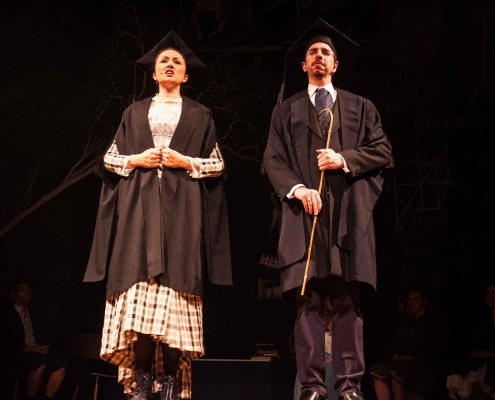 Such illustrious previous-generation LODS performers as Helen Sharpe and Peter Brown give background support, playing representatives of the the bonehead older generation, the show belongs to the kids. I think it was a very brave decision for LODS to undertake this production. 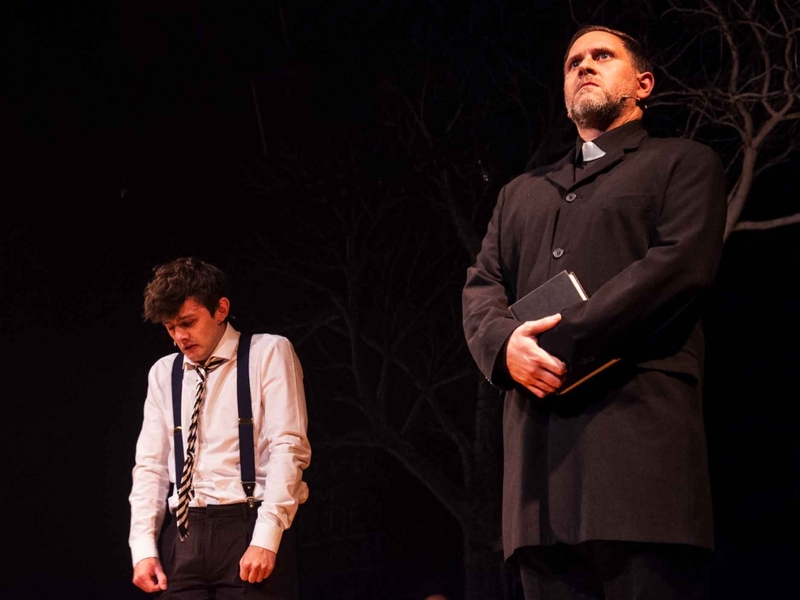 It has a serious and compelling message for our society and, although set in the 1890s, it still has a lot of resonance for today’s audiences. Artistically it was a good choice, but I suspect that it may not have been such a good choice from a business perspective. Personally, I like to be entertained when I go to the theatre, so this production was always going to be one that I would find difficult to watch. 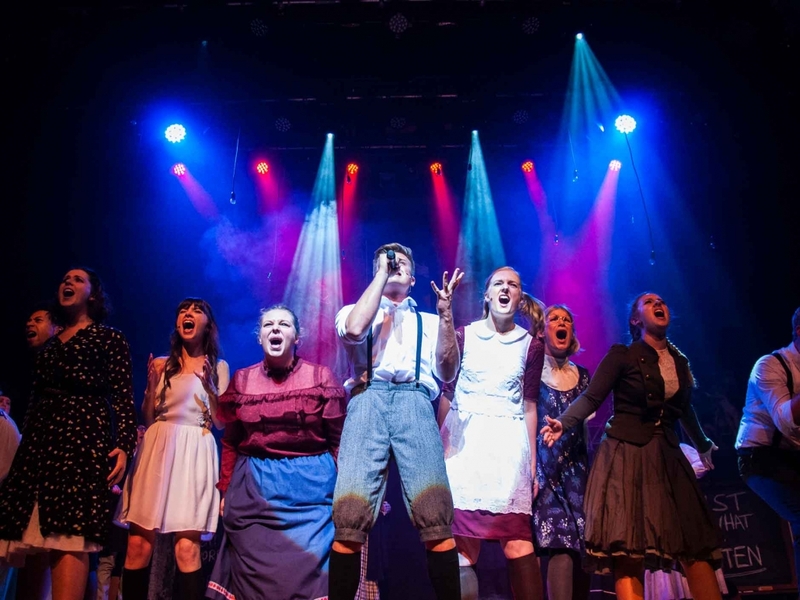 However, there is no doubt about the sincerity and passion of the cast, particularly the younger members for whom the content must be important. Understanding the attitude of society in 1891 is crucial to appreciating the production. The, largely, older audience at this performance did seem to understand the underlying meaning in the text. Again, I found it a bit distasteful, but I completely appreciate the effectiveness of the actors’ performances. 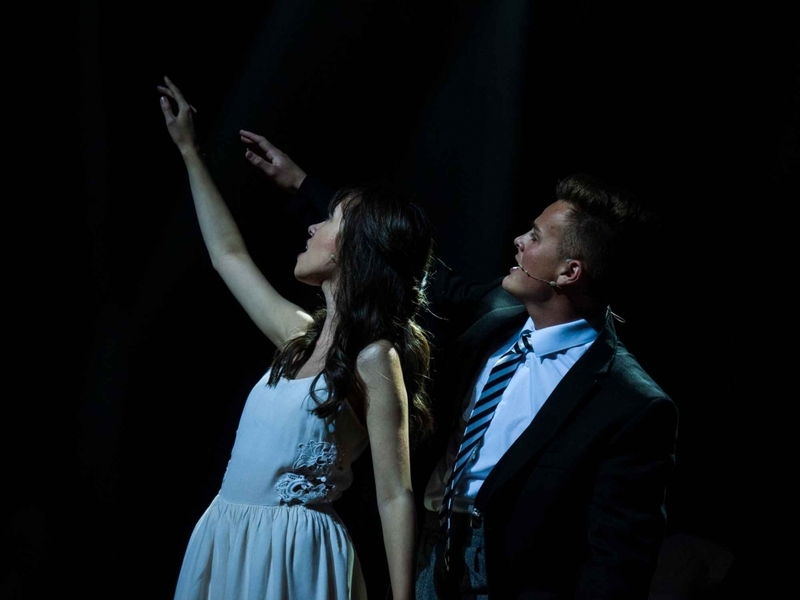 The two young leads, Eva Tobin (Wendla) and James Cohen (Melchior) were very good, Eva, in particular, has a lovely voice which she used to great effect. 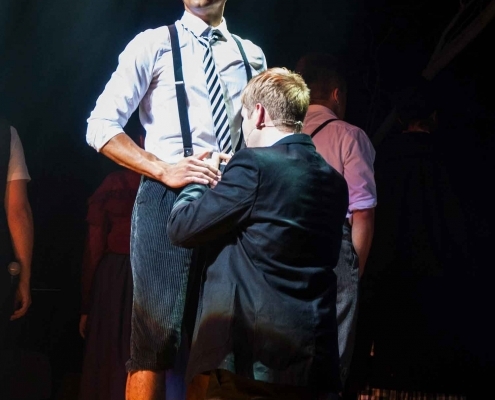 James produced good a characterisation, giving Melchior just the right amount of angst. Matthew Wallace portrayed Moritz extremely well. His body language fully supported the character and we were in no doubt about his anxiety and shame at his adolescent thoughts. The remainder of the young Principals all had their characters well defined, we quickly understood each one’s behaviour patterns. 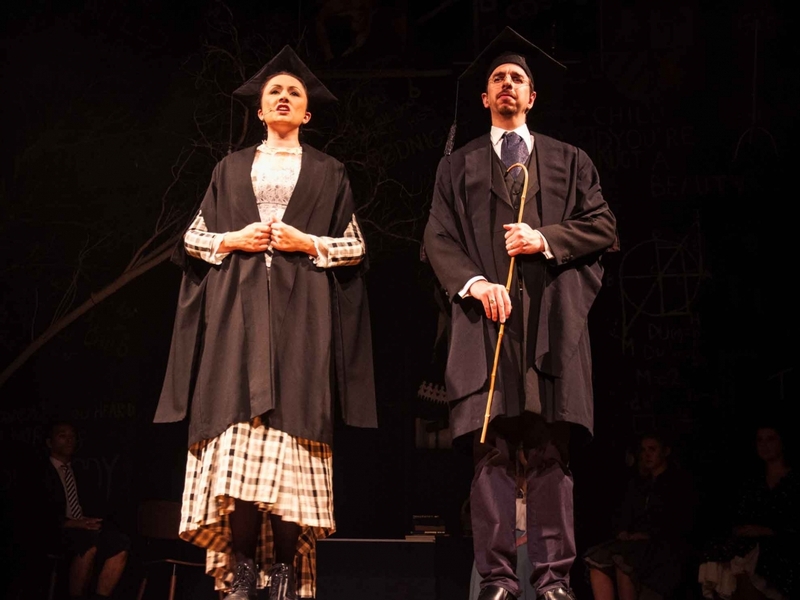 It is a large cast of young Principals and each of them had a recognisable character. LODS has an extremely talented group of performers for these roles. 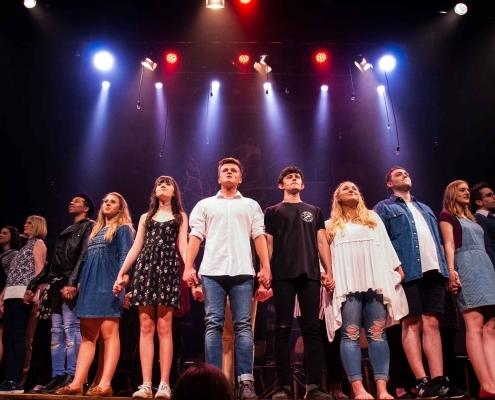 The ‘adults’ were also strong performers, making this a very powerful production. 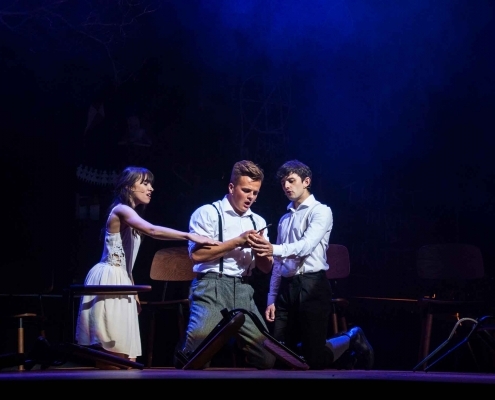 Having all the cast on stage for virtually the whole performance may have been a gamble on Director, Andrew Seal’s part, but it paid off. 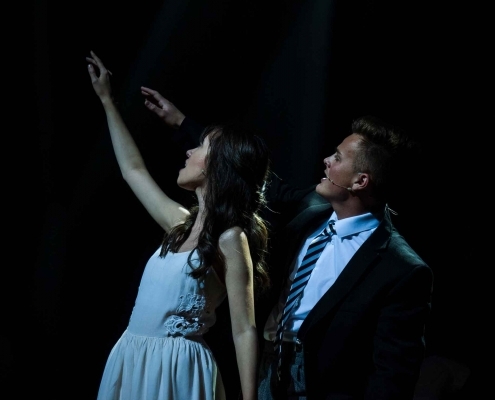 The singing, as we have come to expect, from LODS, was outstanding and congratulations are due to MD Rachael Plunkett. Choreographer Laura Hurrell had quite a challenge as a lot of the ‘choreography’ was in hand movements and spatial transitions. The cast had it to a fine art, beautifully timed and completely in sync. 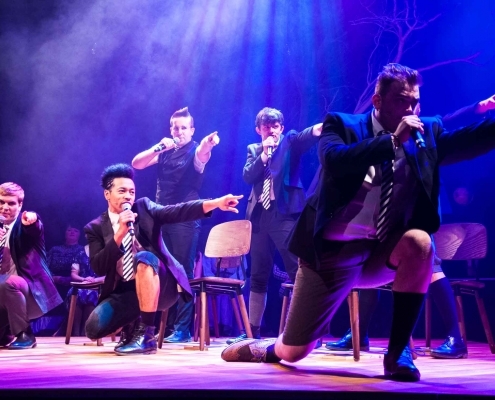 The standing set was impressive, and the choreographed movement of the chairs and other small props was particularly good, well timed and very well executed. Costumes were appropriate although one or two did not work as well as the rest. Lighting was exceptional. 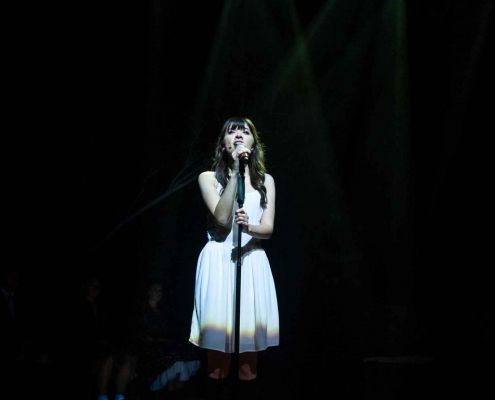 Well done to the lighting operator, who had the timing of the lighting changes perfectly. The sound of both the band and the artistes was also very well done, accurate and effective. 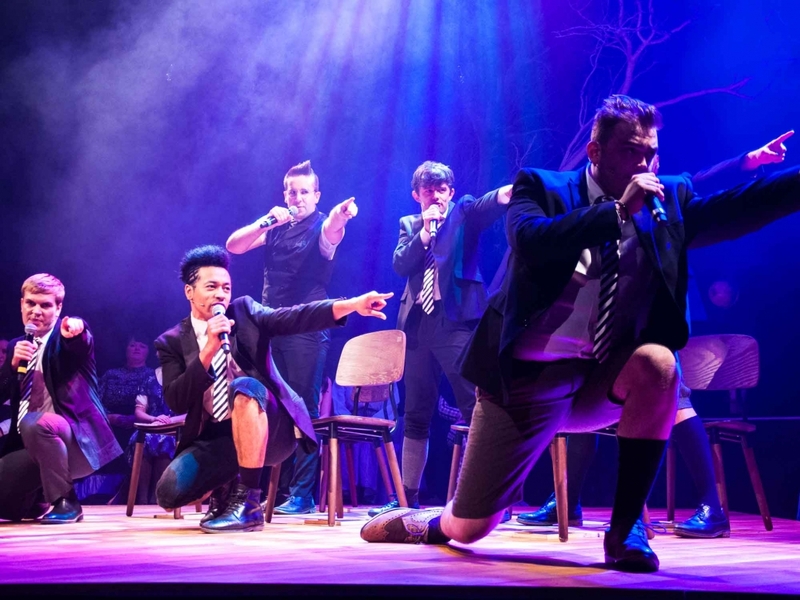 As I have said at the beginning of this review, I like to be entertained when I go to the theatre, this production made me a little uncomfortable, but I suspect that is exactly what the writers and creators had in mind. 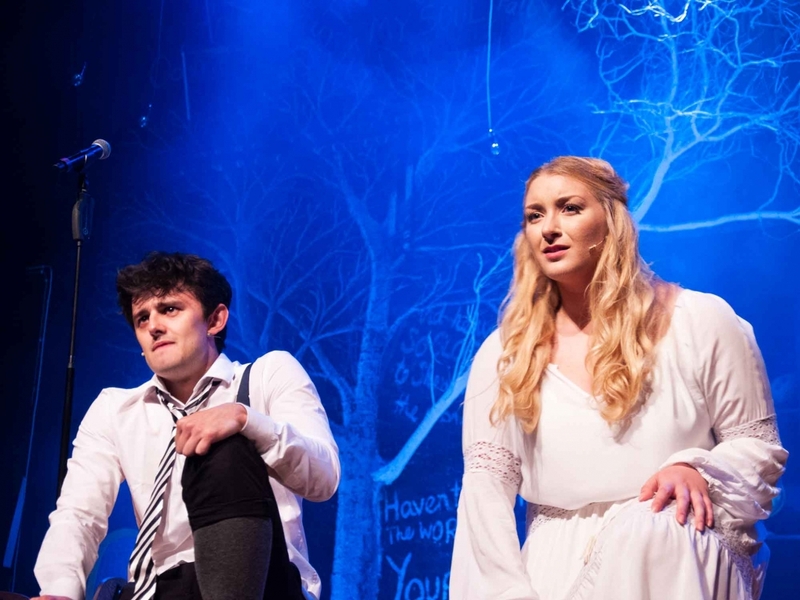 The cast deserve a larger audience, than we saw at this performance, as their performances were all strong. But I suspect a lot of other theatre goers would also find this a little too uncomfortable to watch. Maybe in 5 years’ time the content will be more acceptable to the older generation. I don’t think this will be a show that many societies will take on, unfortunately getting an audience is critical to the continuance of most societies these days. My thanks to LODS for your hospitality, I am glad I got to see the show. Thank you so much for supporting LODS. 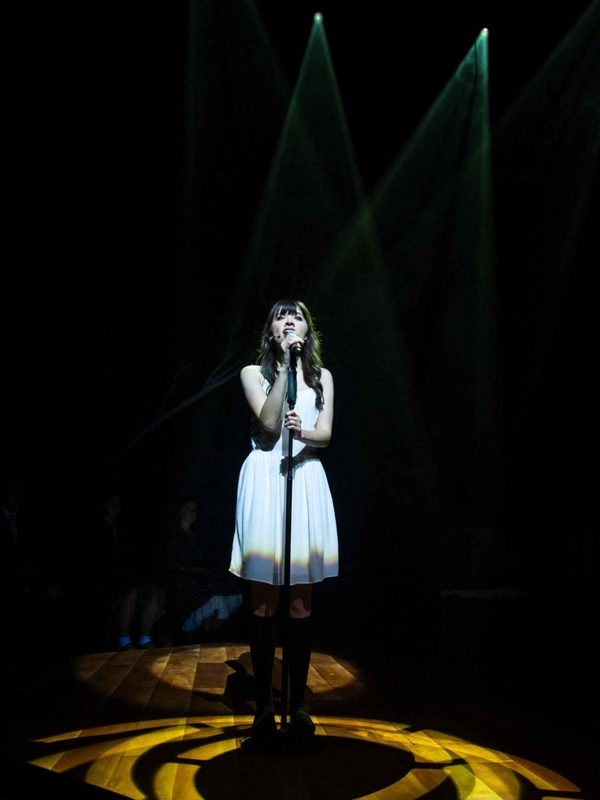 Leave your Spring Awakening review via the link below!